All these questions and more have answers below. Read on for all the info you’ll need to start web designing on your Mac. Web design has been one of the most sought after trades for the past two decades. In recent years, those trades have become easier and easier to access. With these tools at your hand, you can create a focal point for your business or personal work. The internet is the premiere stage with which to showcase yourself. Doing so in a professional manner can make or break you. The Apple Mac computers have lagged behind in certain aspects around the world, but they are far from impotent. A solid web design tool often covers 3 major aspects. The first is ease of use. While those with years of experience in web design will make the best websites, a tool that requires years of experience to even use is poor design. The second is the range of its tools. A good web design tool must give you control over any and all aspects of a web site. Balancing this with an easy interface can be challenging, but the best tools do not skip out on customization. The last is affordability of its total package. You can get the greatest web design tools, but if you have to pay an arm and a leg for it, then it is not something anyone can get in to. These 5 programs and services are not the complete list of all tools available. 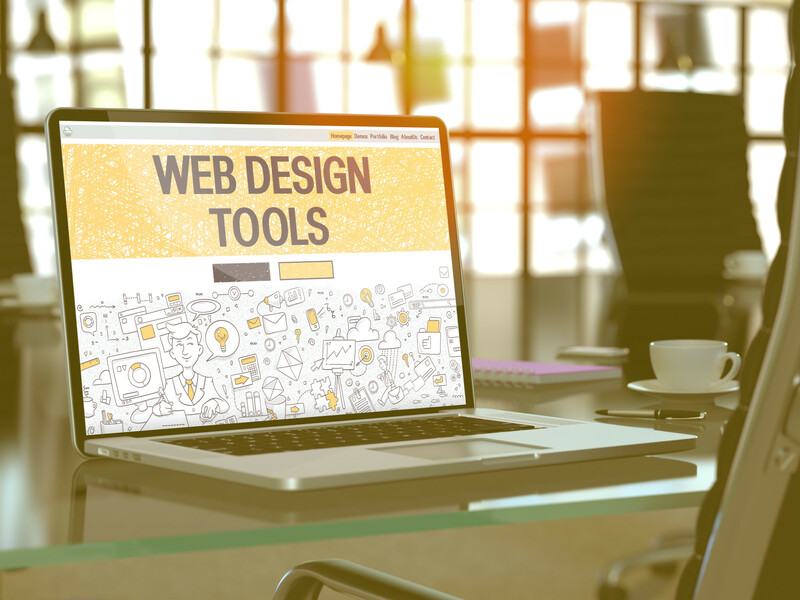 They rank as some of the best and most accessible web design tools out there, but there are other alternatives if you find these 5 do not suit you. In either case, it is best if you start with the 5 listed here. They have proven to be some of the most effective and powerful web design tools around. Blocs is a web design tool with simplicity and ease in mind. Designed to give you a host of options in interchangeable blocks, as the name implies, Blocs works as a web design equivalent of Lego. Blocs does much of the smaller details for you, allowing you to focus on the main concepts and designs you want to showcase on your website. Once you get a handle of the helpful user interface, you are ready to go! Each website breaks down into sections: the header, the body, and the footer. Each of these has color-coded sections and can be each modified as you go along. Every change you make to one section is an automatic change dealt to similar areas. This allows you to keep up a smooth and streamlined appearance across your website. The interchangeable blocks in question are premade website sections. This gives you a decent variety of layouts, fonts, and designs that you construct your website out of. These premade blocks do exclude the idea of building websites, or parts of websites, from scratch. This makes Blocs a web design tool for those who either do not know how to or do not care to have absolute control over every little detail. Blocs has a very reasonable price range, and combined with the longevity of easy update management, can be a very potent investment for a new website designer. EverWeb enables a solid blend of customizable power and easy access. The tool gives you a powerful step up into the world of custom web design, while still providing all the tools needed to still be a drag and drop creation engine. EverWeb has a very simple layout. It replicates a common Mac program structure, with toolbars on the bottom and sides. It also gives you an easy to understand layout of your website so far on the left side, organized into sections. The entire interface has an air complete accessibility. No tool hides from sight or is awkward to reach. You can drag and drop as you please, and EverWeb has a solid selection of premade templates to work with. If you are feeling a bit more adventurous, EverWeb also allows you to create pages from scratch. This process is still simple and easy to use, though it does not provide every tiny tool imaginable, so again, for those who want full control, it is wanting. EverWeb includes many self-made tutorial videos that cover any and all questions you may need along the way. This makes up the primary support tool going forward. EverWeb does lack the more in-depth CSS programming additions. This means that a handful of the potent details that you can alter in a programmed from scratch website are missing from EverWeb’s toolbars. Without this, though, EverWeb is still a potent and easy to use tool. Its drag and drop system is near the top in regards to materials and the end product. This system can cause a bit of a pain if you want a very particular dynamic. For example, menus always keep a certain size and shape to them. This prevents shrinking to menu icons to better assist in mobile website building. That said, EverWeb is still an excellent manager of basic website processes. It brings in and manages all your file assets in a neat manner. If you are looking for a clean, well outlined, and professional website, EverWeb has all the tools to make it come true. TurboWeb has a few admirable qualities that set itself apart from its competitors. First and foremost, it is one of the lowest in price amongst any of the paid programs on the market. This is not a diminishment of quality! This program is good for budgets while still creating quality in an easy to use format. The second major difference to many paid programs is the host of royalty free stock photos that come included with the program. Combined with an ease at including photos from your personal files, and TurboWeb makes breathing life into an otherwise dull, text-filled website, quick and easy. The layout combines many of the easy to use elements found in all popular web design products these days. All of the elements you wish to use on your page you can drag and drop to any part of your website. A host of editable guides keeps your layout structured. These guides allow each website element to fit in perfect harmony with the overall layout and the elements around it. TurboWeb also offers a quick and easy upload system to either an FTP server of your choice or TurboWeb’s own hosting service. This allows your website to be accessible right from the comfort of the program itself. For those who seek to improve themselves with web design programming, or want more intricate design templates and details, TurboWeb can be a little lacking. Some of these problems you can solve through TurboWeb’s ability to add a variety of options to its templates. Many still have a bit of a way to go before it is perfect. Many options are rudimentary. They work fine but have little options for moving forward. That said, for the price, it is hard to argue the sheer level of power and customization you get with TurboWeb. The Sketch web design tool is a marvel of interconnected design. It has a host of options to create a powerful web design experience, but is not for the faint of heart. For those interested in a more in-depth experience with web design, Sketch is a great place to start. The program comes with a full web service. This provides you with many tools to help guide you through the web design process. It gives you a cloud system to save and secure your web design templates and tools. When you save any aspect of a single web design, you can bring it up and use it anywhere else you can access the Sketch network. This allows you to take your previous web design elements and use them as a foundation for your next work. This gives you power over future projects, which is great if web design becomes more than a one time passion. The sharing system also gives you access to libraries alongside other web designers. This can allow for collaboration with any other web designer on the globe. Sketch also allows you to specialize in mobile web design. With Sketch’s tools, you can make websites that are easy to use on mobile devices. All of this does not come at the cost of easy to use tools. While Sketch has many options, its interface still has plenty of details that are kind of new and old users alike. As well, the Sketch support system comes with a host of easy to understand and helpful tutorials. They break down the interface and tools into manageable segments, so you can become a Sketch master in no time. No matter your intentions, Sketch can be the tool that can drive you above a one-time web designer. If you are looking for a one and done website for your own use, Sketch may be above and beyond what you need. Sketch’s price point aims towards someone looking to become a web designer themselves. So, it is not for everyone, but for those who do wish for the best web design tools on the market, they don’t need to look any further. For those who want the system of Sketch without the professional levels of commitment, there is Weebly. Weebly is a website designing tool that is online only. They focus heavily on businesses and aim a lot of their features around online business. Weebly has become a popular tool for those looking to add e-commerce to their website. Weebly gives you the tools and freedom to do business on multiple levels all from your custom website. The templates and interface that Weebly uses keep the gold standard of dragging and dropping assets you need and desire. Weebly also offers hosting services as well as potent marketing tools to get your website noticed. For business owners who seek the complete package, Weebly is an affordable subscription. Weebly does not offer any single addition to the web design process that the others cannot as well. What Weebly does offer is a solid mixture of all of the additions listed in the above programs at an affordable subscription. If you wish for the solid middle man between quick and easy, and detailed and thorough, Weebly is a powerful option. Knowing what you want from your website is what will determine which of these 5 tools are best for you. Are you looking to turn professional with your web design aspect? Then Sketch or even SquareSpace may be your best bet. Are you building this website for personal use? Then the other 3 tools may be better for you. Once you have made a decision on how you will design your website, you will need a domain for hosting it. Many of the tools listed above do have their own ways to host your website. There are many more options, though. Choosing the right domain for your website is a step that you cannot overlook. If the hosting options of your chosen program don’t feel up to speed, we here at MacHighway have plenty of our own options. You don’t need to worry about costs. We have some of the most competitive prices on hosting in the market. Whether you are designing a website you can call home or looking to design many as a future profession, solid web design tools will be your foundation. We at MacHighway believe that the Mac computers can still be at the forefront of design. The tools above are proof of that. This is only the beginning. Learn more information about us and how we can help your Mac computer reach its full potential here.